In August I took my 88 year old mother on a week long trip down the Danube. 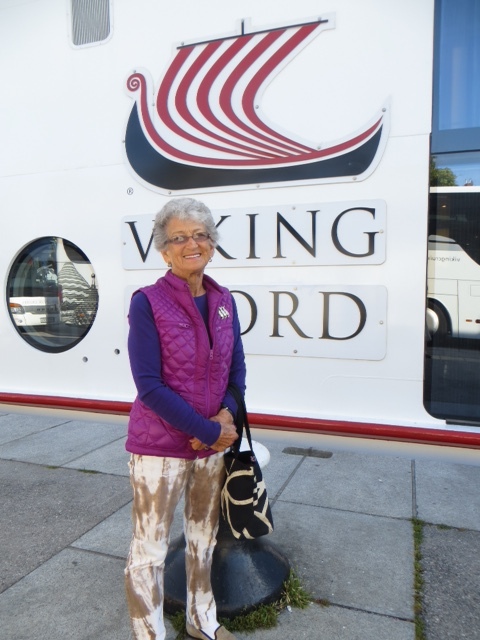 I reserved a suite on the Viking long boat Delling. We flew to Budapest to spend a couple of nights before boarding the boat. We stayed at the Kempinski Hotel, about 3 blocks from the river. the hotel was in a great location for walking and dining. We used a friend of our past guide to give us a 3 hour overview of the city. If you go to Budapest plan ahead and contact Katalin Cezetter at Laleloka@t-online.hu or call at 36 30 8598862 she is amazing guide. We did a tour of the market, a must, you will realize how important paprika is to their cuisine after just a few minutes inside the door. Then across the bridge to the top of the hill over looking the Buda side. We had the driver drop us for lunch at “Gundel’s restaurant. We were seated in the garden and I ordered the pate to start, my mother had the asparagus soup, smooth like velvet on your tongue with small piece of white asparagus as a garnish.This is when you really realize you are in Europe. that evening we went to a local restaurant close to the hotel called “Rezakas”, the duck confit salad we a perfect end to a busy day. The next day we did our time in the modern museum and moved onto the boat in the late afternoon. These Viking boats are like a well oiled machine. They have a staff that will take care of your every need, and a chef that does a great job of feeding the 160 guests 3 times a day. You will have many options and will not ever be hungry. If you are, there is a coffee bar that has cookies all day long. The first port after Budapest was Vienna, each city offers a tour of the local attractions and optional excursions for your choosing. The ship staying in Vienna over night so those that chose to could experience a concert in one of the many historic venues. 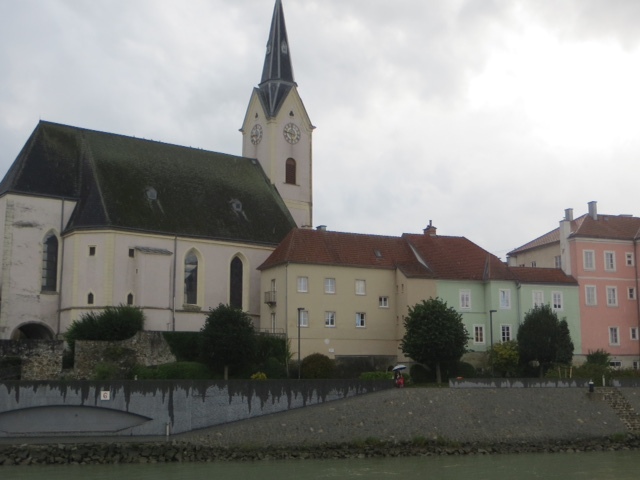 The next day we cruised on to the interesting city of Melk. What you learn is about the problems each city faced during the 2nd world war. How they rebuilt their cities and the history of the many churches and Abby’s many of them over 500 years old. The guides were are very informative and spoke excellent English. When you return to the ship after each excursion you are greeted by a very good staff member and the information for the evening activities will be waiting in your cabin. The cruise is casual and the main thing is to have good walking shoes and a good book since the slow moving boat give their guests time to unwind. Each of the following cities, Passau, Regensburg and Kelheim offered beautiful experiences with a great history lesson in each city. The organ concert in Passau was so inspiring you could have spent the afternoon, and I am not an organ lover. The next part of your journey goes through a series of 16 locks on a 106 mile stretch, it was completed in 1992. We arrived in Nuremberg, were given an interesting tour of the court house where the Nuremberg trials took place. Most of the city was destroyed during the war but has been rebuilt with in the walls of the city. The next day we said farewell to the ship and the new friends and moved to a hotel. We spent an extra night in Nuremburg and took our time walking this historic city. We spent over an hour in the most beautiful cemetery with each tomb holding a large planter of flowers. Then on our walk back, the cemetery is outside the old walls, we stopped at a great café “Sebald”, we shared a lovely lunch outside and the pasta could not have been better. The next morning we flew to Frankfurt for the last 2 days before our return home. I have been to Frankfurt for many years but always in the winter this was a great change. A couple of highlights in Frankfurt were the dinner at “da Claudio”, 069-56-54-71, I had dined with them before and never forgotten the amazing pasta and gracious staff. Go if you get a chance to spend the night in Frankfurt. Their museums are well done and their farmers market, called Kleinmarkethalle is hidden but well worth the trip. This trip is a nice experience the cruise company does and excellent job, but just remember it is a slow journey and not a lot of energy is needed except for the eating part. Several friends and chefs have told me about Gotham West Market so I am passing on the info. A couple of the favorite spots are Ivan Ramen Slurp shop for their rye noodles. For a burger don’t pass up Genuine Roadside where our friend had the fried chicken sandwich, need I say more. The address is 600 11th Ave off of 44th. You can go for breakfast, lunch or dinner but go. Last week a group of us reserved rooms and headed to Lummi for dinner and a slumber party. Two couples drove up to Bellingham and took the little ferry across to the island and 6 of us chartered a sea plane and flew up. We landed on the beach, deplaned and were taken by van about 2 miles to the Inn. We checked into our lovely rooms and settled on the deck over looking the water. Sharing drinks and catching up was a great way to start the evening ahead. Then we watched one of the chefs prepare a fire that was used to sear the bundle of beans and a few other mystery items that would be served later. We gathered at 6:30 for the much anticipated dinner. The dining room seats small groups of 2 or 4 guests so we were in the private room seating all of us at one long table. There has been so much written about Chef Wetzel and everything is true. The meal consists of small bites of things that have been grown, fished or foraged on the island. Each special taste is served in a perfect vessel for the food. 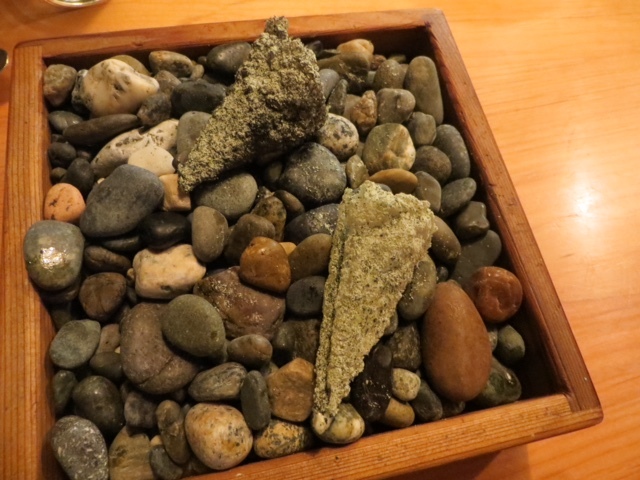 Before your dinner even starts you are served about 6 perfect bites from a smoked mussel served in a cedar box, to a crisp piece of salmon skin rolled with clam mouse inside all served on a small bed of little rocks from the beach. We brought several large format bottles of wine and paid the $30.00 corkage fee. Everyone needs to make reservations and experience this wonderful jewel in the North West.